Vayalur Murugan Temple is dedicated to Lord Subramanya and is near Tiruchirapalli in Tamil Nadu.This temple is around 1200 years old built during the Chola period.Once this temple was surrounded by green paddy fields (Vyal in Tamil), hence the name Vayalur. But due to urbanisation, we can not now see many green paddy fields. The temple has a five tiered Rajagopuram. In front of the temple is the temple tank caled Sakthi theertam or Agni Theertham.Legend saysthat this was created by Lord Subramanya Himself using his mighty lancet (Vel). Inside the specious prakara mandapam walls you can see pictures from Kandapuranam painted. There is a seperate sannidhi for Lord Ganesa.Beyond the Dwajasthambam and Balipeedam you can see the statue of a Nandhi facing towards the sannidhi of Lord Athinathar who is in Shiva Linga form, and beyond that there is a sannidhi for Goddess Athinayaki facing South. The sannidhi Lord Subramaniya is on the rearside of the Shiva's sannidhi. 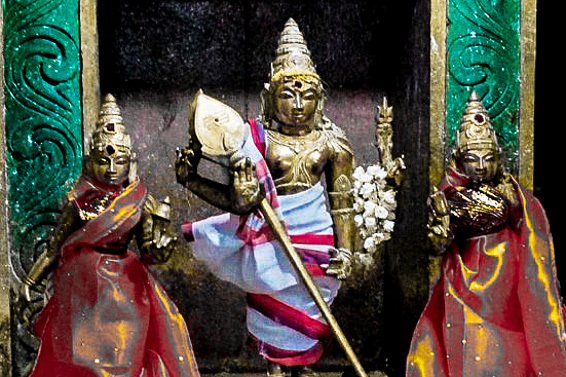 Lord Muruga is seen with His two consorts, Valli and Deivayanai with his vahanam(vehicle) Peacock. Important Festivals: The daily poojas are performed six times a day. Kalasanthi at 6:00 a.m., Muthalam Kalam at 8:00 a.m., Uchikalam at 12:00 a.m., Sayarakshai at 6:00 p.m, Rendam Kalam at 8:00 p.m. and Arthajamam at 9:00 p.m. There are weekly rituals like somavaram (Monday) and sukravaram (Friday), fortnightly rituals like pradosham, and monthly festivals like amavasai (new moon day), kiruthigai, pournami (full moon day) and sathurthi. The eleven-day Vaikasi Visakam during the Tamil month of Vaikasi (May - June), Thai Poosam during the Tamil month of Thai (January - February), Panguni Uthiram during the month of Mar - Apr, Vaikasi Visakam (the birth star of Murugan ) during the month of May - June, Aadi Kirthikai during the month of July-August, Thiru Karthikai during the month of Oct_Nov and Kanda shasti during November are some of the most important festivals in the temple. Temple location The temple is situated at around 7 kms., west of Tiruchirappalli city. 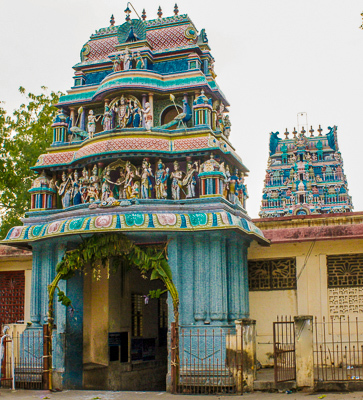 Other notable temples nearby Nachiar Koil Azhagiya Manavala Perumal Temple is one of the 108 vaishnavite divya desams,an ancient Shiva temple Panchavarnaswamy temple, Nachiar Koil Azhagiya Manavala Perumal Temple Malaikottai Uchipillyar-Thayumanaswamy temple Thirukkarambanoor in UthamarKoil ,another one of the 108 divya desams are in the near vicinity of within 10 kms.